A criminal investigation is under way after a large fire broke in Newport. 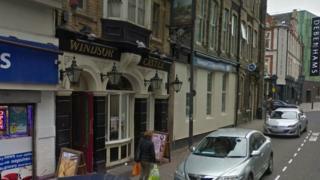 The emergency services were called to a three-storey building near to the Windsor Castle pub on Upper Dock Street shortly after 03:00 BST on Thursday. Gwent Police said the fire had spread quickly and caused "significant damage". Following an assessment of the scene, the force confirmed the fire is being treated as suspicious.